Starting this month, January 2012, I’m restarting my monthly contests. Each month I will give away a book to a reader who has filled out the form on this page (subscribes you to newsletter). 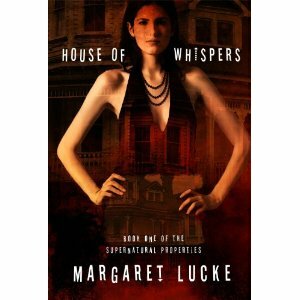 I have three months worth of prizes listed so far starting with the House of Whispers: Book One Of The Supernatural Properties Series by Margaret Lucke. Claire Scanlan is launching a new career in real estate and has a chance to sell a spectacular oceanview home designed by a world-renowned architect. But the home has a problem that frightens off buyers – it was the site of a vicious mass murder. As Ben Grant, the handsome, successful brother of one of the murder victims, shows Claire and a real estate rival the empty house, Claire experiences strange sensations. The unexplainable experiences continue and the idea that the place might be haunted both fascinates and repels her. Claire is also fascinated, and not at all repelled, by Ben Grant. Claire realizes the psychic experiences are real and must solve the mystery of the bloody tragedy – even though Ben seems to be a suspect. To enter this month’s contest, just sign up for the newsletter in the right sidebar or on the contest page. Thanks for making each month something to look forward to, I would love to win “HOUSE OF WHISPERS” BK 1 by Margaret Lucke, it appears to be a great series. I have a free download lined up for January too, Wilma. I’m hoping to put out the newsletter around the 15th. So watch for it! Looking forward “House of Whispers”….my kind of book!! Can’t wait to read “House of Whispers”.